Whether it is responding to a customer query or fast tracking a complaint, CRM system is a quintessential tool today. With automated tracking on various parameters relating to customers, an organisation level can offer proactive & superior levels of support to their customers. The service levels can also be improved with automated SLA tracking. When a client complaint violates the Service level agreement, notifications are sent to higher management for fast tracking resolutions. All meetings, discussions, calls, queries, complaints of your customers are available instantly on the CRM. The live support tools make communication between customers and your organisation easier. The customer representatives are able to provide better solutions to clients based on the data & communication history enabling improved service. The CRM system allows organisations to collect feedback with customer surveys, interviews & feedback. These tools can be integrated to the website of the organisation. Emails can be sent to customers for encouraging them to provide feedback & solicit their inputs. The data collected can be analysed with CRM systems to improve customer service & support. CRM enables you to keep track of all customer communication be it escalations, conference calls or meetings with your representatives. It helps you to automate the follow-up process & communicate more effectively with your customers. The last meeting with your customer, action plan associated with a customer visit, and all follow-ups can be tracked efficiently with CRM systems. The relationships, visits and customer interactions can be driven effectively with CRM software. A CRM system allows organisations to group & segment customers better. The segmentation is important for targeting the customers with the right message. For e.g. the customers can be segmented according to industries, say insurance sector or particular geographical area. The customer segmentation helps the company to improve customer service for the most important clients. The CRM system allows an organisation to track the behavior of its customers, analyse patterns and historical data to improve their products/services. The organisations can use the data to study the customer escalations, pain points and feedback. This can help to prioritise features according to the needs of the market. The customer behaviour and feedback is instrumental in improved outcomes for products/services for companies. A CRM system helps an organisation to study the customer pain points and make personalised offers recommendations. For large customers, companies can offer tailor made solutions according to the nature of their business. A CRM system enables one to follow all customer queries, interactions and social media communications, leading to improved product pitches. When organisations communicate with their client’s requirements, demands and preferences, it establishes a strong rapport. Proactive communication plays a significant role in maintaining key client relationships. A good CRM system allows you to monitor tasks, projects and key activities related to a customer. The information can also be shared with customers using the CRM system. The completion of various milestones and major events can be communicated to customers on regular basis. The increased transparency and communication with clients results in higher satisfaction. Administering support calls day in day out can be a draining process. CRM systems provide Gamification tools to manage the processes. Every activity that involves a customer interaction rewards the employees with points. These rewards and bonus associated with key customer activities motivate employees resulting in better customer service. The social media channels are great way to tap into your customer conversations. The top brands are using social media to analyse the sentiments about their products and services. Social media has become a great avenue to learn what your customers are saying about you. The social media data can be integrated with CRM systems and mapped with customer profiles. Brands today are expected to have an Omni channel presence to instantly respond to customer enquiries, complaints and also seize the business opportunities. Great service is the key differentiator for delighting & retaining customers. A CRM software is a great tool to measure, track and improve customer service. In the fierce competition among brands for supremacy, serving your customers is a sure fire way to success. 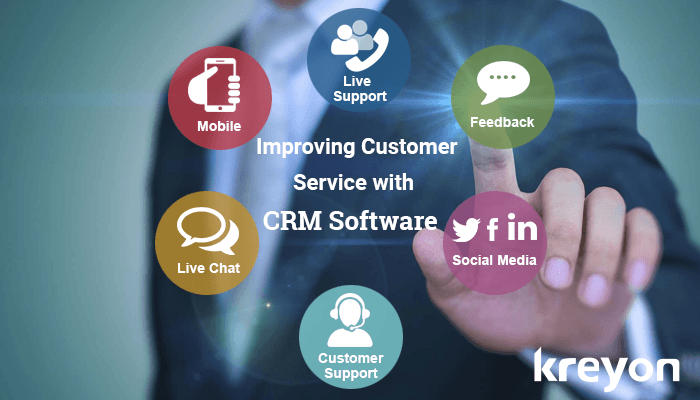 CRM system that helps you to manage client escalations, live support for your products/services, and enables realtime communication with customers is a growing need. Great service is the only way to win business and customer loyalty.